Since the eighteenth century artists have found inspiration in the sublime mountains of Snowdonia or the romantic coastal scenery and picturesque industrial landscape of Wales. Few have been drawn to the isolated farming communities in the west. John Elwyn consistently drew upon his experience of rural life in his native south Cardiganshire, inspired by his feelings towards the Welsh landscape, its people, their language and long-established social traditions. John Elwyn trained at the RCA in London and was encouraged to stay in London by his friend and artist Ceri Richards , who put him in touch with various London galleries. By the end of the 1940's he was exhibiting regularly with the Royal Academy. In 1948 he moved to Hampshire, his move out of London was to take up a post at Portsmouth College of Art followed by one at Winchester College of Art. 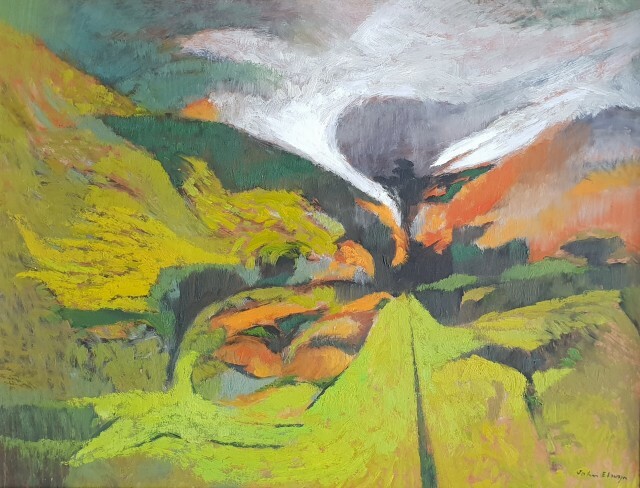 "What he achieved was work of such merit that it will take its place permanently in the artistic history of Wales.......the work of John Elwyn will always stand out and be admired, for John loved the land he painted and the people who lived in it and had a talent to communicate that love to others." Sir Kyffin Williams on the work of John Elwyn. National Library of Wales; National Museum of Wales, Cardiff; University of Wales; Welsh Arts Council; Tate Gallery, London; Contemporary Arts Society of Wales; North Wales Arts Association; Museum of Modern Art, Machynlleth.